While the difference between a 2% and a 3% growth rate may not seem like much, it influences what has historically been a strong relationship between real GDP growth and corporate profits. Over the past five quarters, the revenue growth of S&P 500 companies has barely been above 1%, providing little impetus to bottom-line earnings growth. The good news is that as we approach 2014, an economic reacceleration seems to be on track. At the same time, the threat of global macro risks of recent years, including European sovereign debt and China’s economic slowdown, is shrinking. At the moment, it is important that U.S. politics does not derail the recovery. The thrust that could push the economy higher may come from the pent-up demand of households and businesses. 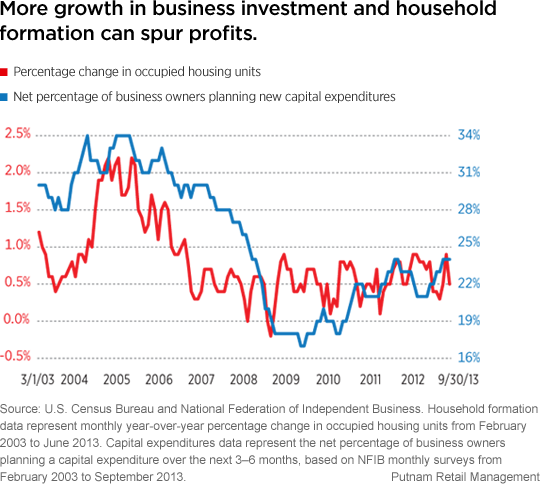 Household formation fell sharply during this downturn and only began to pick up again in 2012. Over the past couple of years, more people have felt confident to move into their own apartments or to buy houses. These are the preconditions for future growth in consumer spending, as it costs money to furnish or update houses, and to raise families. Businesses, similarly, have been slow to ramp up capital expenditures and hiring, although these trends are at least moving in a positive direction. The big question today is whether CEOs and CFOs perhaps see the same signals that the Fed perceived. Do they have high expectations, warranting greater investment and hiring, or do they detect weakness that calls for continued caution? We believe it would take additional spending, driven by rising expectations, for the economy to provide the setting for stronger earnings growth. 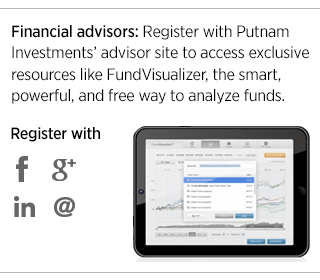 Read Putnam’s fourth quarter Capital Markets Outlook.